Continuing the 3DPBMCSHMtm… As an interdimensional nexus, Bellotra suffers from elemental corrosion. This dissipation of matter into magical energies is prompted by a multitude of permanent gates. Bellotra is fragile and its fabric frays, tainted by para-elemental and quasi-material manifestations. This problem is typically mitigated by bringing in new matter from the elemental planes. Spell casters are paid handsomely for this. While the Ten Thousand Worlds offer material Bellotrans refuse. They fear their world becoming another. Attempts to set decanters of endless water in fountains ended in theft. The simple way is for people to go to an elemental plane via plane shift, retrieve material and return it. Janni make easy coin this way. Genies also create materials for clients. This is tolerated, as extraplanar influence is undesirable. Those who pay are usually bored nobles or rare druids. The resulting material is mixed with native elements to bolster them against elemental corrosion. More dangerous routes involve opening temporary gates. This may lead to elemental eruptions, where the element being gated in surges uncontrollably into Bellotra. 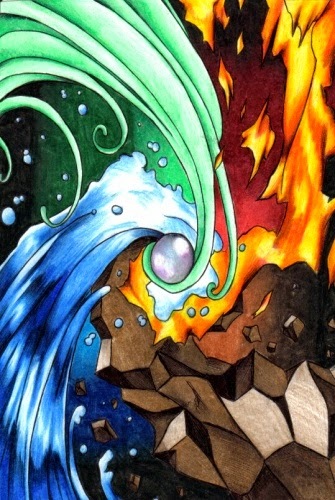 Cyclones, wildfires, eruptions and tidal waves are all examples of elemental eruptions that bedevil unwary spellcasters. Other methods are possible though at the DM's discretion. The Chill Sea becomes clogged with salt ice floes, some of which blaze with eerie corposante. The few beaches on the Chill Sea also change. Some are stained with rust while others develop 'deathbars'. These piles of pale, greenish yellow minerals mix calcined baryta, nitre and garnierite. Corrosively toxic, they cause chemical burns and a racking cough on inhalation. Only the strangest beasts and appropriately clothed survive them. Alchemists can make fortunes mining a deathbar. Until shoggoths persuade them to move on. The nickel, alkalines and black powder are worth it. Volcanic mud silts canals and releases brimstone vapours. The rice fields grow fruitful with this mud so the poor dredge canals with noble assent. Deadlier hazards like quicksand in the fens around the Rotten Burgs can turn a battle's tide. Smogs form about the Rotten Burgs and noble towers. Lifelong residents boast racking coughs. These fade after a month of exposure to clean air and return after a month in the Burgs. The mountains of the Far Spires contain active volcanoes, some sages believe their activity is increasing. Ghouls who explore the glass and steel spires for knowledge claim the volcanoes have damaged them. What strangeness lays within them? Roll d10 when adding flavour for the day. All temperature variations are in Fahrenheit. Ash clouds darken sky, outside illumination and low-light vision is halved for 2d6 hours. Creatures visually affected by sunlight are not affected during this time. Any rain during this time leaves ashen patina. Chill blue-grey mist hangs in air. Temperature drops by 10 degrees. Visibility limited to 300' in open ground or shoreline. Lasts 3d6 hours unless dispersed by wind. Dust storm blows through for 2d6 hours. Visibility is reduced to 10', Listen and Spot checks take -4 penalty as do ranged attacks. Unless protective masks, magics or other countermeasures are taken 1 in 6 chance of blinding for 1d6 rounds and taking 1d3 subdual damage each round. Freezing fog reduces visibility to five feet. Those beyond 5' are concealed from sight (this also includes infravision). Exposed structures gain hoar frost. Lasts for 3d6 hours, dispersed by wind or large fires. Hail storm rattles the area for 1d6 minutes. 1 in 6 chance of 1 damage to unprotected characters per round from large hailstones. 1 in 6 chance of rain following for 1d4 hours. Haze fills humid air, tinting everything sepia. Light and visibility is halved yet infravision is unaffected. Temperature increases by 10 degrees. Those not wearing protective masks take 1d4 subdual damage every hour. Lasts 2d6 hours unless dispersed by wind. Orange ball lightning of 1d8+8 inch diameter. Lasts 1d8 rounds, moves 3d6 feet in random direction each round and 1 in 6 chance of arcing to a character for 1d8+1 damage. Finds metal-clad characters attractive, vanishes silently afterwards. Sleet storm reduces visibility and ground movement by half. 50% chance of extinguishing lanterns (75% chance for open flames). Imposes a -4 to ranged attacks, Spot and Listen checks. Lasts for 2d20 minutes. Smog cloud blown by ill-favoured winds lasts for 1d4 hours. Illumination is halved and visibility (including infravision or low-light vision) is reduced to 5'. Those beyond 5' are concealed from sight. Those caught in the cloud must save vs. poison each round or take 1d3 subdual damage. Protective masks can prevent this damage. Violet corposante (St. Elmo's Fire) forms on pointed structures, providing candle-light illumination for those structures. Lasts for 6d6 minutes then dissipates unless subjected to sudden moisture. Deadliest of all manifestations is the aurora vortex. Green and blue aurorae usually light Bellotran night skies. A crimson spot in the aurora presages a pillar of vacumn touching the ground like Death's finger. This forms an cylinder in which the living are chilled and suffocated for a round. Then air, smoke and dust howl into the void with explosive force, rending all but metal. As likely as a lightning strike, they are drawn to significant electrical discharges. After lightning storms or more than 12 dice of electrical damage in one round, the aurora above the area turns red. The wise move quickly away. The next round, a cylinder of vacumn 1d20+20' diameter appears from the heavens. Those within the vacumn face a save vs. death to avoid 5d10 damage from lung collapse. If successful 1d6 subdual damage is taken. Those without lungs or gills are unaffected. The intense chill causes 2d4 cold damage and freezes water in the area. The area is silenced and all flames are extinguished. Speech is impossible, spells with verbal components and all sound-based effects fail. The next round, air and dust explosively fill the void from all directions at once. The winds are tornado strength, doing 6d6 damage to the unprotected and hurling them 3d6 feet in a random direction. Giant-sized creatures are knocked prone. Attempts at Listen checks fail. Buildings and other structures take damage.